The reception area is often your best chance to make a good first impression. 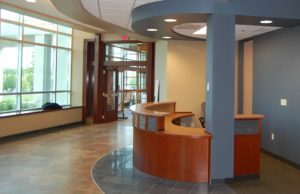 There are several practical concerns to consider when planning your reception area, including space considerations, pricing, and the number of guests you need to accommodate. However, you should also take into account the overall appearance of your reception area and whether it will appeal to your guests and make them feel welcome. We’ve put together these suggestions for designing a custom reception area that will wow your guests from the moment they set foot inside. Guests may use your reception area for more purposes than just waiting for a meeting. Others may find themselves waiting for longer than they had planned and decide it’s a convenient place to get work done. This is why it’s important to keep comfort in mind when designing a reception area. Have an array of comfortable chairs on hand, as well as some tables that allow guests to spread out their devices or documents. You may also want to provide a coffee maker, bottled water, granola bars, or other light refreshments. On busy days (or bad weather days), the reception area can quickly get dirty. Avoid having to clean up snow or mud every few minutes by providing elements that are stylish but still easy to clean. Place runner rugs near the entrance to prevent dirty slippery floors, and provide umbrella holders and coat racks to store guests’ wet outerwear. Don’t let your reception area turn into a generic space. Use design as a chance to reflect your company’s brand. Display the company logo prominently, and consider decorating in the company’s colors. You should also choose furniture, art, and other decor that reflects the personality of your company. For example, choose sleek and modern decor for a technology company, and posh expensive fixtures for a business in the finance industry. A cluttered reception area portrays a business that is unprofessional and unwelcoming. Make sure to leave plenty of space for guests and workers to move around. Since the reception desk is the hub of the reception area, you need to take special care to ensure that there is plenty of room around it. These suggestions are just some basic considerations to get you started. While we sometimes work directly with project owners who know exactly what they want, typically we are part of a much larger project team. The image above of the reception area we built for the Strong Ambulatory Center was designed by Hanlon Architects. Beaver Creek Industries has experience working closely with architects and engineers to assist in the design process. Our knowledge of methods and materials can help shape the design to keep it constructible and within budget. To consult with us on your project, contact us at 607-545-6382 or bci@beavercreekindustries.com.